The Book Rat: Zombie Chicken! 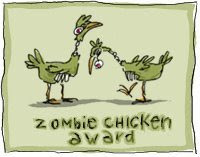 I got a zombie chicken award from Velvet over @ vvb32 reads! I covet this award, so just imagine my excitement! Have I told you lately how much I love your header? Thank you!! Now where's your review of CF, I must read it! I know, I need to review it and The Hunger Games both. I've just been crazy busy, and every time I sit down at the computer, I get distracted, and get absolutely nothing productive done. Thanks for the award my dear. I know what you mean about the distraction bit, my reading has actually plummeted since I started this blog. urgh. Thank you so much for the award! :) Love it! Thanks for the award Misty!!! & I have one for you on my blog!! !